Tom Brady passed for 22 of 33 for 315 yards and threw four touchdowns in leading New England to a 41-25 win. He improved to 26-3 against Buffalo , and matched a record set by Brett Favre, who went 26-9 against Detroit. The Patriots (7-1) have won four straight since Brady returned after opening the season serving the NFL's four-game suspension. It was Tom Brady's first four-TD outing since he threw four in a 36-7 win over Miami last October. And it was the most he's had on the road since throwing four in a 37-22 win at Orchard Park on Oct. 12, 2014. Brady threw touchdowns passes on his first two drives. They included a 53-yarder to former Bills receiver Chris Hogan, who beat cornerback Stephon Gilmore. The Patriots took control of the game open by scoring 27 points over five consecutive possessions. Brady connected on a 53-yard pass to Rob Gronkowski, and later to Danny Amendola, Julian Edelman also caught a touchdown pass, while LeGarrette Blount scored on a 1-yard run. Rob Gronkowski, Buffalo New York Native finished with five catches for 109 yards and set two franchise records with his 53-yard touchdown catch . 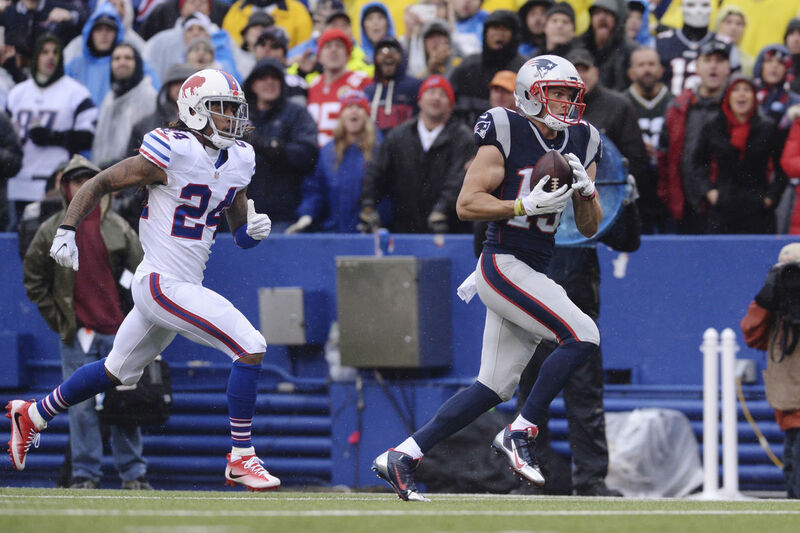 It was Gronkowski's 69th touchdowns and 68th TD receiving, moving him one ahead of Stanley Morgan in both categories. Buffalo's offense was further depleted with three of its top four receivers sidelined, including Marquis Goodwin (concussion). The Bills offense sputtered minus their offensive top threat, running back LeSean McCoy, who is sidelined by an injury to his left hamstring. Backup running back Mike Gillislee scored on a 3-yard run and Tyrod Taylor scrambled for a 26-yard touchdown on fourth down in the third quarter. Jonathan Williams scored on a 1-yard run with 30 seconds left. The Bills had five sacks, upping their season total to 26 five more than they managed all last season. Veteran defensive tackle Kyle Williams had one, his 38th, moving into eighth on the franchise list, one ahead of Sherman White.